Newly built stone house, 10 meters (33 feet) from the sea. All new appliances. Private beach, with clear sky-blue water. House and the beach are located on the the sunniest side of the bay. House is kids friendly and we can provide baby crib and a stroller. Donja Lastva is a town in the Boka Kotorska bay located on the sunnies and most attractive part of Montenegro. It is famous for its long sunny days, high temperatures and exceptional natual beauty. Beside its popularity as a summer resort, winters are mild and town is nice and quaint. Pefect for sightseeing numerous local points of interest, both historical and fun. Donja Lastva is ideally located in the foothills of the Vrmac Mountain equally distanced from historical and tourist destination like: Kotor, Trebinje, St. Stefan, Budva, Cetinje, Durmitor, Ulcinj or Dubrovnik. We have numerous hiking and mounting bikig trails leading up the Vrmac mountin. Solila, one of the largest Bird Sanctuary in Montenegro, are a 30 minutes drive. Donja Lastva is 20 minutes walk from Porto Montenegro, largest Luxury Marina in the Southern Europe and 30 minutes walk from Tivat. Scenic costal route will bring you to a modern city with thriving culture and lifestyle. Aboundance of beaches, gateway points and welcoming locals make Donja Lastva your perfect next gateway. Nearby, are numerous restaurants, bars, cafes and shopping destinations. We are able to provide guided boat tours of Boka Kotorska Bay and local beaches. We can help you arange motorcycle and car rentals. Our close proximity to three local airports, travel buses or private transportation, makes us your perfect starting or finishing point for travels all around Montenegro, Southern Balkans or the rest of the Europe. Dubrovnik which is one of the UNESCO historical protected towns is an hour of driving distance away and we are able to provide guided tours to Croatia or other local and foreign destinationsa. Being centraly situated on the crossroads of Southern Balkans, it is a perferct starting point for visiting up and coming Albania. It is only few hours drive to the south of us. 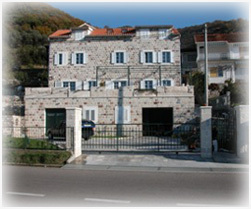 Address: Donja Lastva 29, 85320 Tivat, Montenegro.